SESRIC launched the OIC Health Portal during the 6th Islamic Conference of Health Ministers (ICHM) of the Member Countries which was held on 5-7 December 2017, in Jeddah, Kingdom of Saudi Arabia. 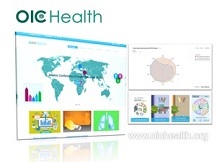 The OIC Health Portal was developed by SESRIC in line with the implementation of the OIC Health Communication and Publicizing Strategy that was endorsed by the 5th Islamic Conference of Health Ministers, held on 17-19 November 2015 in Istanbul, Republic of Turkey. The portal will act as the main information sharing platform for the OIC efforts in health area among ministries of health of OIC Member States and other partners. The portal is expected to strengthen the communication and promote all the activities related to the implementation of OIC Strategic Health Program of Action (OIC SHPA). The portal provides all the data regarding the domain of health for all OIC Member Countries. The content of this database will be regularly updated and enriched based on information collected from OIC Stat Database hosted by SESRIC. The portal will also serve as a library for all reports and publications related with health. Any development regarding the programmes and projects that are implemented by the ministries of health of OIC countries or OIC institutions, as well as networks of cooperation in the domain of health will be regularly reflected in the portal.